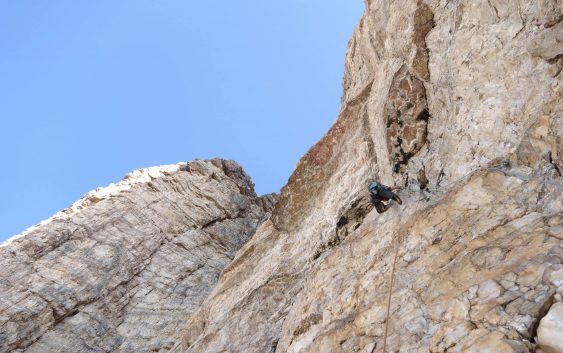 The Dolomites are an amazing place and whilst I might not recommend the Egger Route, there are many neighbouring climbs that are amazing from the Classic Yellow Edge up the same tower as this to the even more impressive Comici route on the North Face. Not to mention the many other great routes in the immediate area. So whether you want to go on an amazing walk, via ferrata or rock climb let Vertical Life sort out the trip of a lifetime for you. Our Dolomite adventure are run by experience guides who have a passion for the area. We have a flat rate of £400 a day for the guiding and this does not include hut fees or accommodation. <a href=”mailto: mark.reeves@mac.com?Subject=Dolomites%20Adventure”>Email Us</a> to find out more.